Is your workout weighing you down? If the bulk of your gym visit is wasted wandering from machine-to-machine, cut calories and time off your fitness routine by picking and sticking with one piece of equipment to maximize results. Mold multiple major muscle groups and enhance endurance with this one and done dumb/barbell-based high-intensity resistance circuit. Perform the following exercises with little-to-no rest in-between sets to increase intensity and caloric expenditure. Power through your workout by raising the barbell with this multi-joint, total body movement. With proper posture, an activated core and feet hip width apart, hold the barbell at the shoulders. Hinge back at the hips until the thighs are parallel with the floor, then push through your heels as you drive your arms into an overhead position. Return the bar back to the shoulders until the elbows are tucked and touching either side of the ribcage. This is one repetition. Repeat 10-12 times. Get a leg up on your workout by incorporating exercises that focus on strength, balance and coordination in one swift step. With a free weight in each hand, take a big step back into a reverse lunge. Remember to keep the front leg’s knee above the ankle and the rear leg’s knee aligned below the hip to form two 90 degree angles. Check to ensure that both feet are facing forward, as the back foot tends to slide to the side in this position. 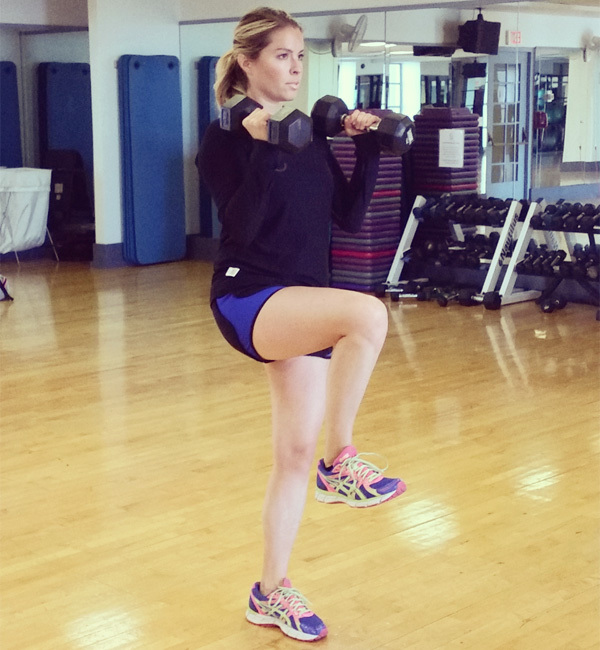 Swing both dumbbells forward into a bicep curl as you bring the rear-extended leg to the front of the body. Hold for one count and repeat this motion for 10 repetitions on both legs. There is no need to excuse yourself after letting out a good burpee. This dynamic and physically demanding exercise brings the heat by burning calories and your lungs. Prior to attempting this exercise, walk through each step and be mindful of your form to prevent injury. Start with a light weight in your hand and stand tall, with feet hip width apart. Hinge back at the hips and shoot your shoes back into a pushup position. With the body forming a straight line from the head to the heels and shoulders aligned over the wrists, lower yourself into a pushup and back up to a plank. Row the weighted arm back until the dumbbell is tucked next to the armpit. Bring it back to the ground, then roll the weight to the other hand and repeat the row on the opposite arm. In an explosive movement, jump the feet up toward the outside of the hands and push through the heels into an upright, standing position with the dumbbell resting at your shoulder. Press the dumbbell overhead and then return to the starting stance. Repeat 10 times. Less is more. Rack weights at the gym, not wasted time.